Lauren Roskoph (right in photo) and Gracia Mahan met about 15 years ago at a jewelry fabrication and casting class and quickly discovered that not only were their kids at the same school, their fathers had both been into woodworking and their mothers into art. “We had a lot of crossover,” said Gracia. Friends started asking them where they got the jewelry they were wearing, and they launched their Atherton-based jewelry company — Lauren & Gracia Jewelry — in 2008. The jewelry is now carried in 50 stores all over the country as well as available online. You can meet the jewelry makers at a fundraising event they are having for Eastside College Preparatory School on Saturday, May 2, from 3:00 to 6:00 pm at 885 Santa Cruz Ave. in downtown Menlo Park. They will be donating 25% of their sales to the East Palo Alto school. The kind of jewelry they make has evolved over the years. 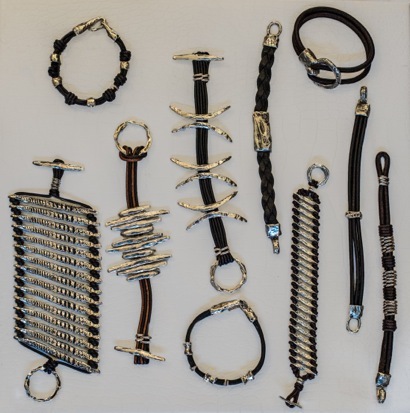 They now work primarily in leather and silver and recently added diamonds to some pieces. A new men’s line is sparking interest by a major upscale department store. They thrive on evolving and experimenting, pushing the boundaries of fabrication, which is by its nature precise. In contrast, they find beauty in imperfection. They liken their partnership to a marital partnership. “We’re together a lot of the time, so it’s a good thing we get along!” said Gracia.